This C-Bus xx5034NIRT infrared transmitter unit transmits IR codes to third party devices such as amplifiers, DVD players, TV set top boxes and video projectors. The unit stores a library of commonly used IR codes. The installer has the facility to modify the stored codes using the Windows® based application software (CIRCA). The unit is capable of broadcasting IR messages through the two IR output channels (consisting of 3.5mm mini audio mono sockets). Single or dual head emitter leads (ordered separately) should be connected to the output jack. The unit is programmed by connecting a programming cable (see related products - ordered separately 5100HSCU) between a PC and the unit. 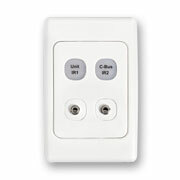 The Infrared Transmitter is based on the standard range of Clipsal four gang wall plates. The standard colours are White Electric, Soft Grey, Desert Sand, Cream, Brown and Black. Please Note: Before C-Bus Infrared Transmitter Units become functional, they have to be programmed by a Nous House Installer using the Windows® compatible configuration software. The manufacturers warranty may be void if this is not complied with.